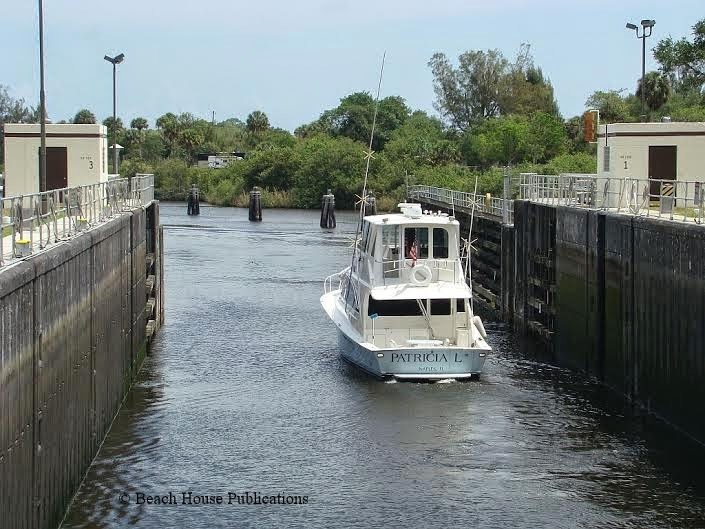 The St. Lucie Lock and Dam is located a little more than 15 miles upriver from the “crossroads” at the St. Lucie Inlet, the Atlantic Intracoastal Waterway and the St. Lucie River. Approximately 10,000 vessels transit this lock every year and the majority of them are recreational vessels. The Locks are operated from 7 AM to 7 PM, seven days a week. It takes about 20 minutes on average for boats to lock through completely. Signs indicate the arrival point on both sides and the Lockmaster is contacted on VHF Channel 13. He will give instructions to wait for the green light before entering and the Captain can choose the side of the lock on which to tie. Lines are dropped from the lock walls to secure the boat at the bow and stern as the water levels are raised or lowered. The Lockmaster announces when it’s safe to proceed after the lock gates are opened. We don't have enough information yet to determine if our experience with the Caframo 747 fans are just an isolated case that only we have experienced, or whether this is a problem with other fans of the same model. On both our Mariner 40 ketch, Sea Trek and now our Marine Trader trawler Beach House, the Caframo 747 model fans have been our preference for many years. The fans use the least amount of power, are the quietest and move the most volume of air of any other fans we have used. The fan is mounted using the more permanent mount and hard wired into a circuit breaker. The circuit breaker did not trip. As full time cruisers, improving the air flow inside the cabin is very important. In the last year, we have had two failures that have given us serious concern. Just over a year ago, one of the fans, which is mounted in our main salon near the lower helm station, suddenly began smoking and the body of the fan became very hot. Fortunately, we were able to shut off the power immediately and no harm was done other than evacuating the smoke. A replacement fan lasted about a year when we noted the smell of electrical burning and immediately determined that it was the replacement fan. The second time there was no smoke, but perhaps that was because we quickly shut off the power. Our concern is what might have happened if the fans were running and we were off the boat, even for a short period of time. Usually all fans, etc. are turned off when we leave the boat for any period of time, but not if we step off the boat for short periods, like talking to neighbors or taking out the trash. We now worry about these fans and whether we should consider another manufacturer in light of our experience. We have contacted Caframo about the issue, but as of yet, have had no response. We would very much like to hear from anyone else that has had issues with this specific product. I am sorry for the bad experience you had with the Caframo model 747 fans. Please be assured that we take these issues seriously. With your fans we only us special Fire Retardant grade plastic for the housing so that should the motor seize there is not risk of fire. However, with older units, should a motor seize heat can get sufficient to cause some smoke and smell. Our new fans have added thermal protection so that should the blade get jammed or the motor seize current will be cut off to the unit ensuring all components keep at low temperatures. We will gladly send you a new unit at no charge. Please confirm your postal address and I will arrange for a unit to be sent to you. 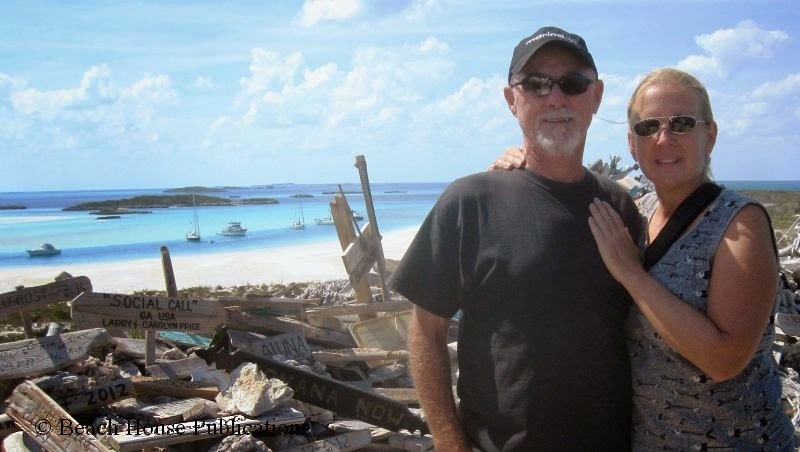 One of the benefits of cruising as a couple for over 20 years is the fact that we have met some wonderful people and made many friends for life. Whether traveling by land or sea, we can't travel very far without needing to stop and visit with one of those friends. And Lord help us if we travel past and fail to visit. Many of our friends are former cruisers that are now land dwellers and some are still into the live-aboard lifestyle. So we would still have a few more friends to visit on this transit of the ICW. But the next day would be for just cruising and relaxing at our next destination, the free town docks at New Smyrna Beach. All of our friends and followers can keep track of our locations in almost real time. For quite awhile, Beach House has been using the Argus Survice Engineering (spelled correctly) on-board sensor platform for recording depth data as we travel along the waterways. This data is uploaded to Argus computers at the end of each day. Beach House is just one of many commercial and pleasure vessels equipped with the Argus systems. 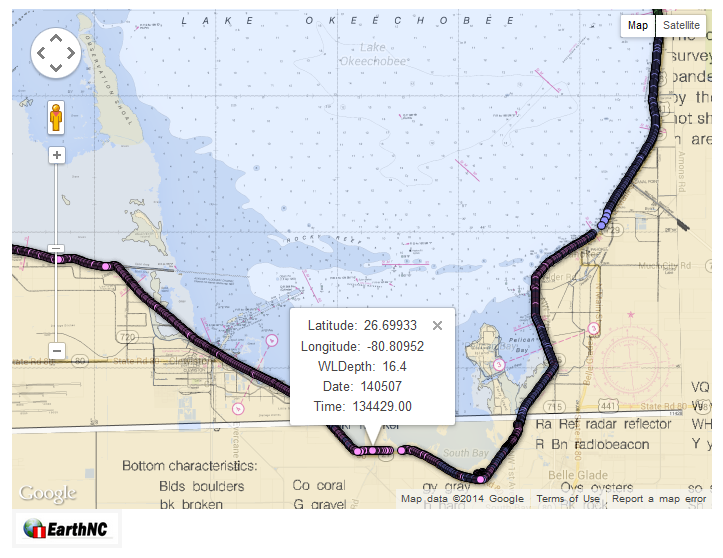 You can follow along with our progress by visiting our page on the Argus website, http://argus.survice.com/vessel_tracking/images/trackline-MarinaLife.html and moving the map around. Clicking on one of the bubbles along our track will bring up depth and other information. This can also be a good resource for finding data collected from other participants by visiting the Solution Set page, http://argus.survice.com/argus_sample_data.asp . This data can be one more resource in your safe navigation arsenal. Have a safe boating season. For you Facebook users, visit our Facebook page for lots of photos of these places and news updates of the waterways.